Born in a small North Vietnamese village, Nguyen Phan Que Mai grew up in the Mekong Delta, South of Vietnam. She has an MA in Creative Writing from Lancaster University (UK) and is the author of four books of poems. Que Mai has been translated and published in English, Spanish, Bahasa Indonesian, Chinese, Uzbek, and Bengali. She has been honored with the Poetry of the Year 2010 Award from the Hanoi Writers Association as well as the Capital's Literature & Arts Award. Her latest poetry collection The Secret of Hoa Sen, translated by the author and Bruce Weigl and published by BOA Editions (New York), is said to build new bridges between Vietnam and America - two cultures bound together by war and destruction. Que Mai has recently been awarded a scholarship to pursue her PhD studies with Lancaster University, where she will research and write about Amerasians – children of American soldiers and Vietnamese women – who were born during the Vietnam War. Teresa: What inspired you to write the poems in The Secret of Hoa Sen? Que Mai: I used to work as a communications specialist for several United Nations agencies. My work took me around Vietnam where I met many disadvantaged people who struggled to survive yet they inspired me with their courage. I felt the need to become their voices. Some of my poems in The Secret of Hoa Sen also deal with the trauma of the Vietnam War. It has been forty years since the war ended but the wounds it left behind are still bleeding. I write about these wounds and about Vietnam’s human stories, with the hope that international readers will come to know about Vietnam as a country and as a culture. Teresa: How long did it take you to write the book? Que Mai: I am not a full-time poet so it took me a long time to put together the manuscript (laugh). I think it took about three years and two more years for the manuscript to be translated into English. I had the privilege of working with the poet and Vietnam war veteran Bruce Weigl in translating this book. Translation is a very challenging but interesting process. It helped me look deeply into my poems, reflect on them and search for their true meanings. Sometimes as I worked on the English translation, I would go back and improve the Vietnamese versions. Bruce Weigl is a fantastic poet so I learned a lot about poetry in English from him. In the most recent poems in the collection, I started writing first in English and then translated the poems into Vietnamese. It was a lot of fun. When the book was selected by BOA Editions for the Lannan Translations Selection series, I felt honored; however, I was worried since the poems would be published in English as well as Vietnamese and would be printed in America. I was concerned about mistakes with the Vietnamese language since Vietnamese is full of diacritical marks and any misplacement of any of these marks would have disastrous consequences. But I am very happy to say that BOA did an amazing job. The book is beautiful and all Vietnamese words appear perfectly. Teresa: What do you think is the poet’s role, if any, in society or the world? What do you think is the power of poetry? Que Mai: One of Vietnam’s most acclaimed poets, Phung Quan, wrote “Có những phút ngã lòng/Tôi vịn câu thơ mà đứng dậy” - “In moments of despair/Poetry is the anchor to hold me up.” I believe poetry can give us hope and light. As a way of communication, poetry also has the power to build the bridges of understanding between nations. I have witnessed those bridges being built during my recent book tour in the United States where I read in Atlanta, New Mexico, Rochester and New York City. I remember the warm embrace and the tears of two young women whose fathers fought in the Vietnam War. They told me that their fathers are still suffering from trauma and my poems helped them understand much more about the war and about their fathers. The meaningful dialogues I had in the U.S. opened my eyes, too. Years ago, I used to think about American soldiers who fought on the Vietnamese soil as our enemy, but now I know they are humans, just like us. I understand that no matter what side you are on, you will always lose during a war. Teresa: Can you please tell us about the title of your book and why you chose this title? Que Mai: The title of the book is The Secret of Hoa Sen. Hoa Sen is lotus – the national flower of Vietnam. Even though the lotus grows from deep mud, it is pure and beautiful. I adore lotus flowers, also because my mother grew up near Làng Sen (the Village of Lotuses). She told me that during the summer of her childhood, the ponds surrounding her home would be filled with lotus. As a little girl, my mother used to row out to these ponds in a sampan boat when the sun was about to set. Bringing with her a jar of dried tea leaves, she would put some tea into the blooming lotus flowers. At night, as the flowers closed their eyes, they would soak the tea with their perfume. The next morning, my mother would row out in her sampan boat again, to collect the tea from the flowers who are opening their petals to the first sunrays. In the old times, members of Vietnam’s royal families used to send people out to lotus ponds, to collect morning dews from the lotus leaves, to brew their lotus tea. 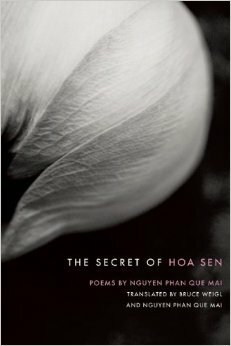 Such fascinating stories about the lotus inspired me to write the title poem “The Secret of Hoa Sen.” You need to read the poem, and the entire book, to find out what the secret is. Teresa: Your poems are closely tied to the natural environment in Vietnam, its flora and landscape. Can you please tell us more about your connection to these elements? Que Mai: I was born in a small rice-farming village in the Ninh Binh, in the North of Vietnam and grew up in Bac Lieu, in the Mekong Delta, South of Vietnam. I remember that the doors and windows of my homes were rarely closed and nature was a part of our life. I loved climbing trees and wandering about in the rice fields, searching for grasshoppers, mud crabs, shrimps and fish. Believe me, Vietnam is a rich country when it comes to natural landscape. I am saddened, though, that some of our nature is being compromised as our country develops. Trees are being cut down and forests destroyed. I think my poems are a way for me to moan for the loss of nature and to call for people to show their love and care for the environment. Teresa: The poems in The Secret of Hoa Sen deal with a range of subject matters from human suffering to the celebration of life, war and freedom, sadness and joy. In writing the poems, no matter the subject matter, your heart and soul in their compassion and gentleness are evident. How does your poetry reflect yourself? Que Mai: I read somewhere that in writing poetry, you must reveal yourself as a person. I think my poems come from my lifetime of experiences. I didn’t write until the year 2006 when I was 33 years old. By that time, I had experienced surviving the last two years of the Vietnam War as well as the terrible poverty and turbulent changes following the end of that war. I experienced plenty of darkness, growing up as a Northern girl in Southern Vietnam. I was working as a street seller before a scholarship from Australia changed my life and opened up many new doors for me. I am indebted for the blessings I have received in my life and would like to give back somehow through the social work that I do, as well as in my writing. Teresa: What is your writing process? When and how do you write? Que Mai: In 2006, after several years of studying and working overseas, first in Australia, then in Bangladesh, I returned to Vietnam. It was a wonderful feeling to be surrounded by the Vietnamese language. During my years overseas, I felt disconnected with Vietnam and upon returning to Vietnam, I started reconnecting with my country and my people again, through my poems. My best poems always come quickly, without any effort. It means that my inspiration is ripe for the story. If I struggle with a poem and it takes more than a few hours to complete it, it means it won’t be any good and I will discard all the drafts. But that’s only the actual writing. I talked to a friend recently and he said that writers write all the time, inside our head. Writing is about observing, listening and formulating stories inside us. As I observe and listen, I might take notes for writing ideas. I always have a list of writing ideas with me. In that way, if I touch a story, even the tail of it, it won’t be able to escape me. I think all writers are sponges that absorb what’s going on around us and our writing is a way for us to process the information. The devastation in Nepal’s earthquake reminded me very much about the precious time I had visiting Kathmandu. I remember vividly the beautiful face of a Nepali child who gave me the most beautiful and happy smile. I am worried about him and wrote about me searching for him in the rubbles of the earthquake. I do hope that he is safe and that he is able to read my poem one day. Teresa: What new writing projects are you currently working on? Que Mai: I have just graduated from Lancaster University’s Master of Arts in Creative Writing. It’s one of the top ten of UK’s universities and the program is fantastic. I wrote my historical novel in English, Song of the Sơn Ca, during the course and received a distinction. I am polishing the novel right now, in order to send it out. I have also completed a novel for young adults entitled Riding on the Dragon’s Back. It’s about growing up in communist Vietnam. Riding on the Dragon’s Back is being put through a serious test: it’s being read by a group of 13-14 year-old boys, as part of a book club. I can’t wait to hear their feedback. Believe it or not, I am also writing in Vietnamese. I have found publishers for my two forthcoming books. The first is a book of childhood stories called Những ngôi sao trên bầu trời thành phố (Stars in the City Sky). The second book is the second part of my book of travel stories Từ Tuyết đến mặt trời (From the Snow to the Sun). I enjoy my work as a translator, too. In a few months, Vietnam’s Kim Dong Publisher will launch “African Moon,” a series of 10 books about African animals. I translated these books but worked closely with the writer Janet Keegans and the artist Harriet Matsaert—we developed the ideas of this series together. I have been translating selected international short stories for key newspapers and magazines in Vietnam. My book of translated stories, which includes stories of amazing writers such as Amy Tan and Junot Díaz will be published in 2016 and is entitled Taking Flight. Translating poetry is my passion. The American poet J. Fossenbell and I have worked together for three years in translating the poetry of Huu Thinh – one of Vietnam’s most important poets. Our translated collection Wild under the Sky has just been published by the Vietnam’s Writers Association Publishing House and will soon be available on Kindle. I have also been collaborating with Prairie Schooner in introducing Vietnamese poetry to the international reader: in a few weeks, our Vietnam Fusion project will be launched (website: http://prairieschooner.unl.edu/fusion-archives). I wrote an introduction for 16 Vietnamese poems and helped translate many of those. I am also pleased that I am working together with the Vietnamese American poet Teresa Mei Chuc (Tuệ My) in translating contemporary Vietnamese poetry. Our poems will be featured on the Atlanta Review as well as the radio program Melodically Challenged. Our works will also be published in a dual-language anthology, to be released by Shabda Press. With so many projects going on, I can say that I rarely experience something called “The Writer’s Block.” I normally work on different projects at the same time, and this requires a lot of discipline. When I was little, I always woke up at 4 a.m., went to the field and caught tiny shrimps to sell at the morning market. These days you might see me at my writing desk at 4 a.m., catching the earliest words of the day.